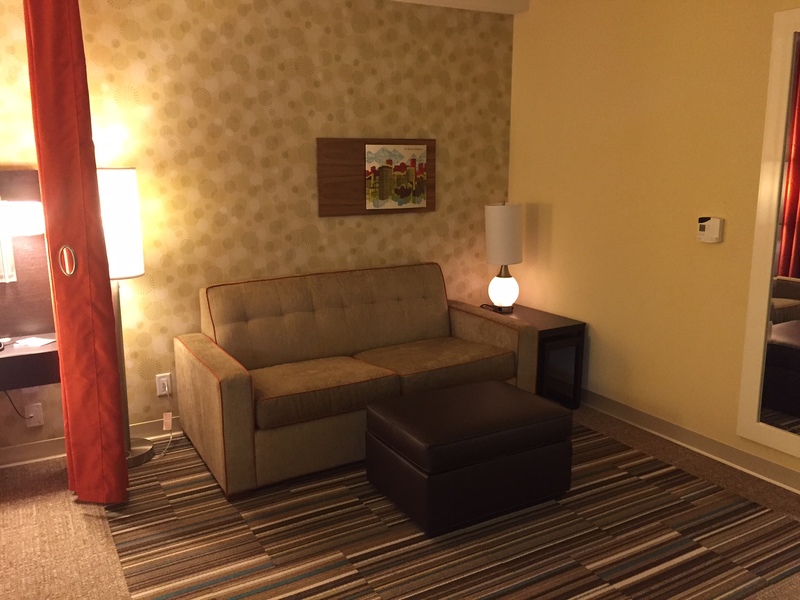 We stayed in room 218 at the Home2 Suites by Hilton in January of 2016. We booked this hotel after reading good reviews about it online. It is advertised as an extended-stay hotel, but we were only there for two nights. It is just off 170th Street, so access to West Edmonton Mall from here would be very convenient. 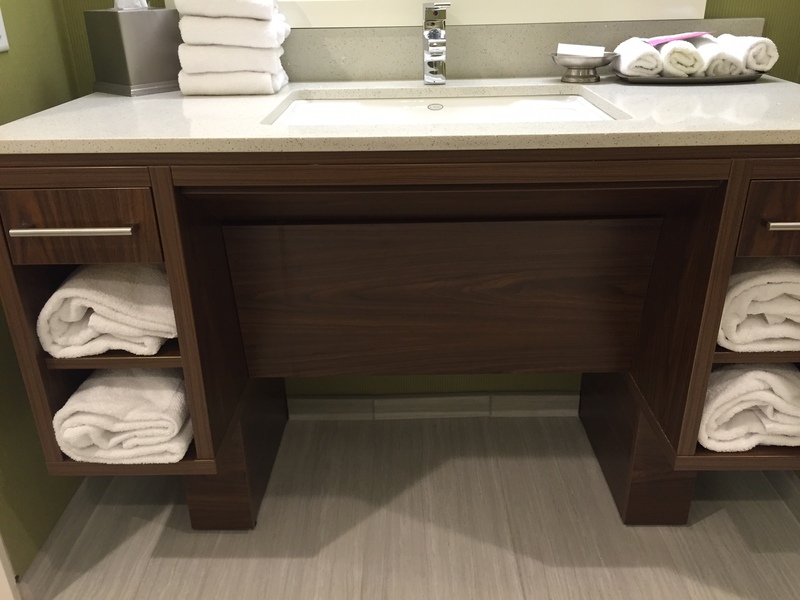 This hotel was very clean and appeared new. 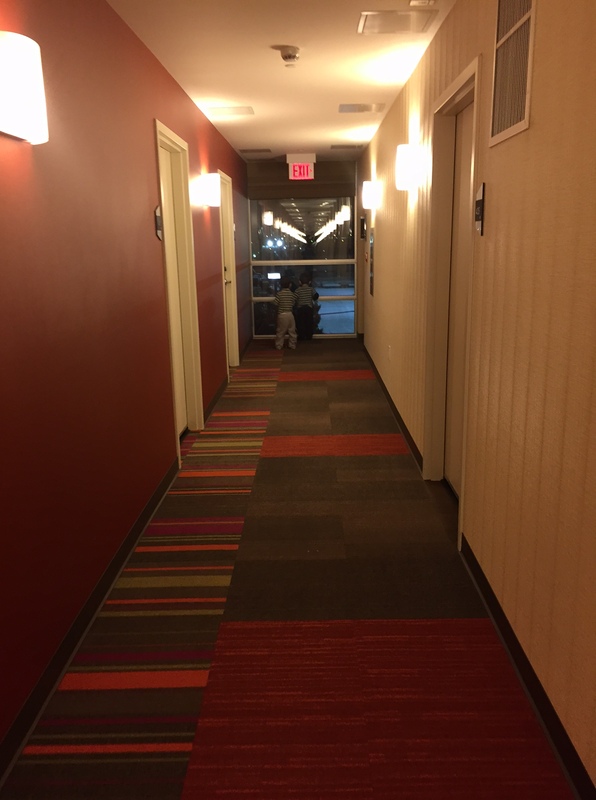 Our room was fully-wheelchair accessible and was very spacious. There was a queen-sized bed and pull-out couch and ample room for two playpens. 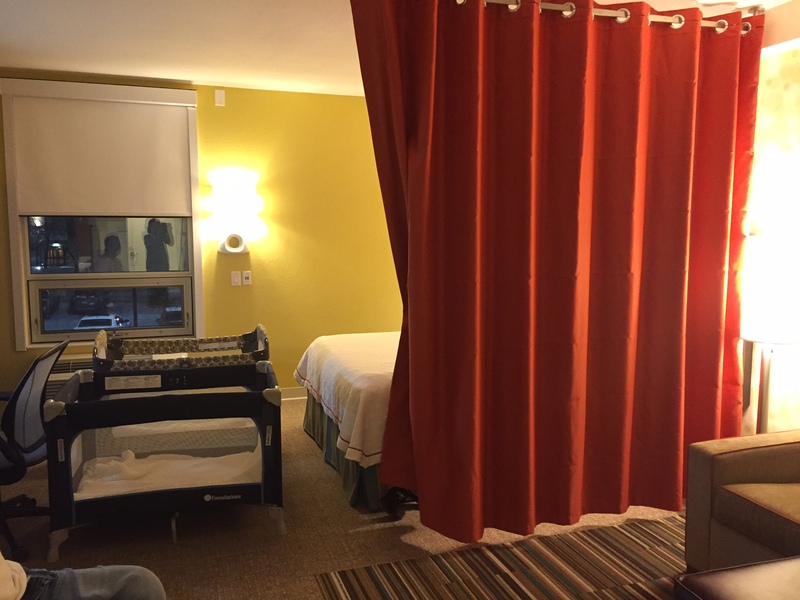 There was a curtain that could be pulled across the room to separate the bed from the couch, which would be really nice if you were sharing the room with a friend or an attendant. 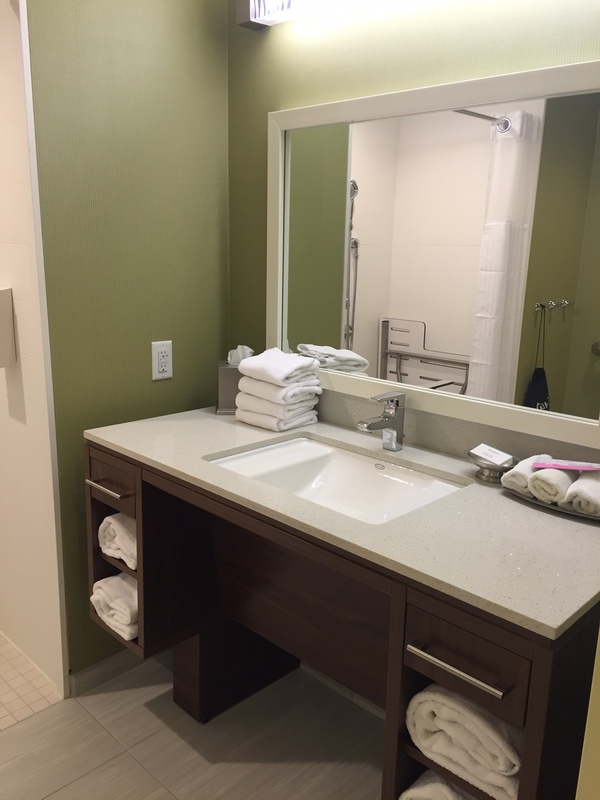 The bathroom was complete with a wheel-under sink, a wheel-in shower with fold-down shower bench, and one grab bar by the toilet. 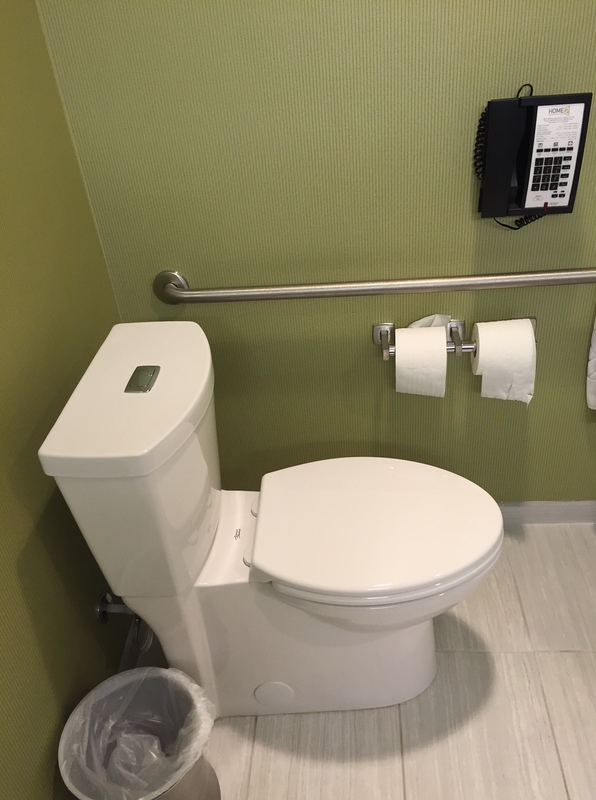 There was even a phone by the toilet for emergencies. 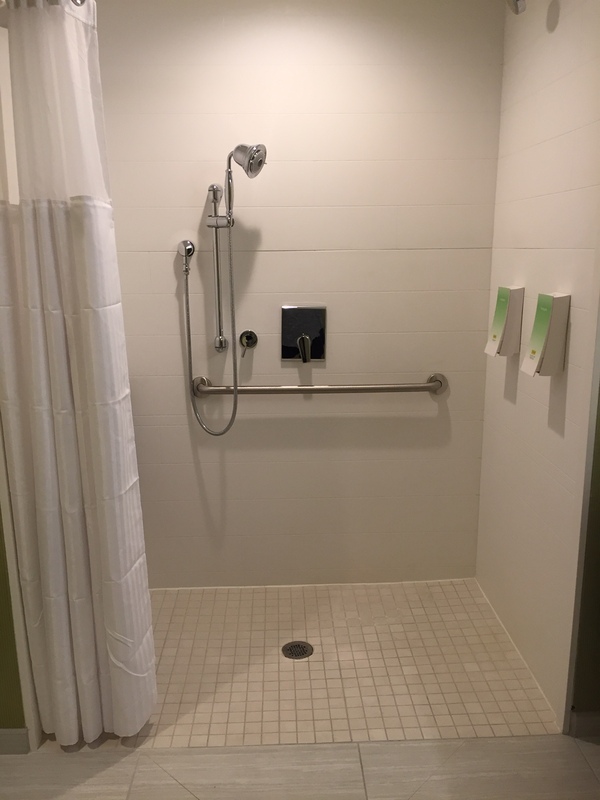 The wheel-in shower had two shower heads, one handheld and one mounted on the wall like a normal shower. 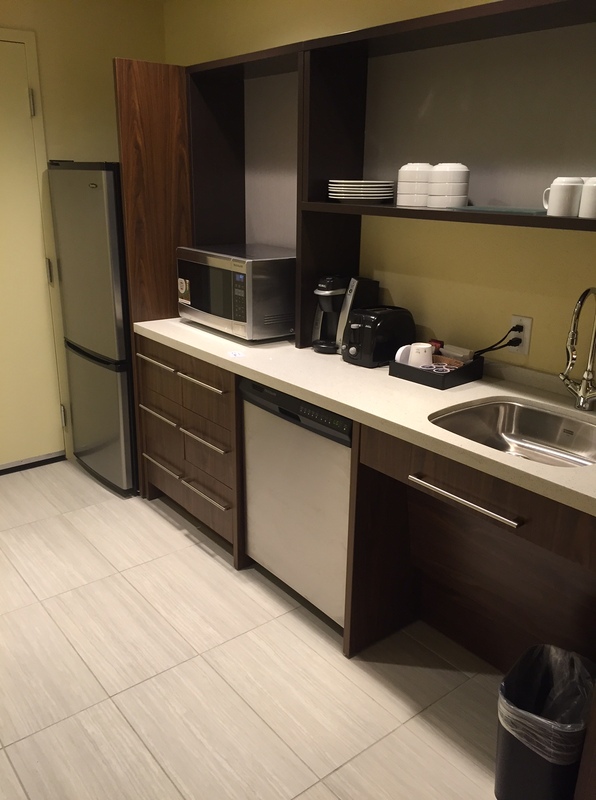 There was a kitchenette in the room which was stocked with dishes, cooking utensils and eating utensils. There was a full-sized fridge, microwave, dishwasher, toaster and a Keurig coffee machine. The sink in the kitchenette was also wheel-under. There was a desk with a table underneath that could be wheeled out if you were hosting company or if you preferred to eat dinner at a table. 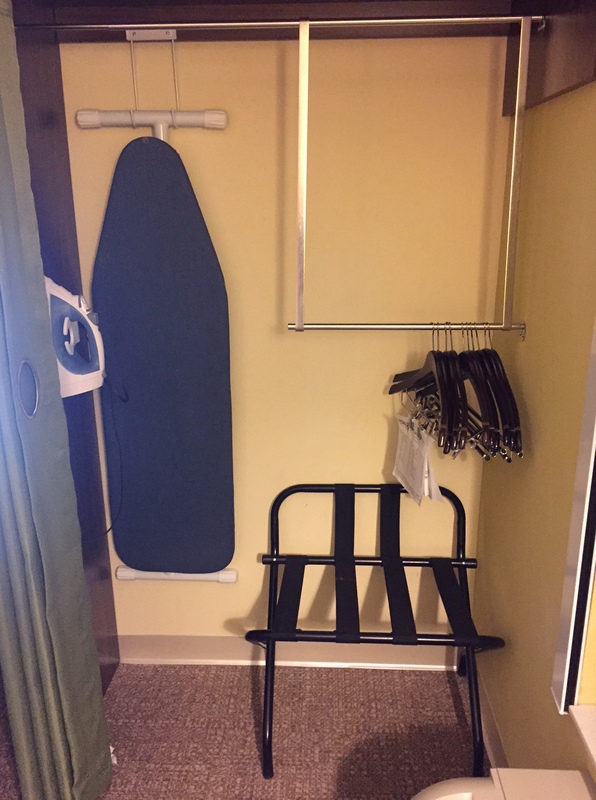 There was also a TV, in-room safe, iron, ironing board, and a small closet. 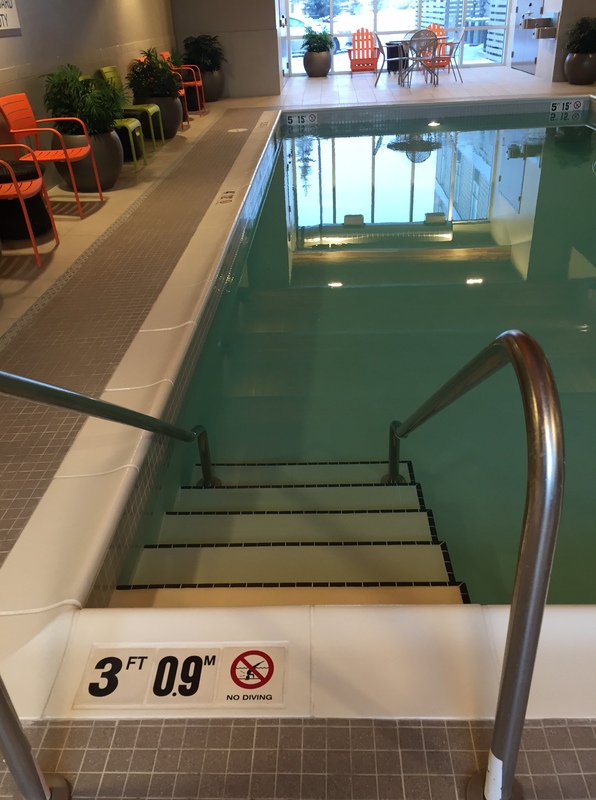 The hotel had a pool, which I understand will be accessible. They advised that they have a pool lift coming but that it had not yet arrived. There was a large sign in the pool area that said “Pool Lift” so I suspect this will be installed shortly. There was a large, accessible bathroom in the pool area. 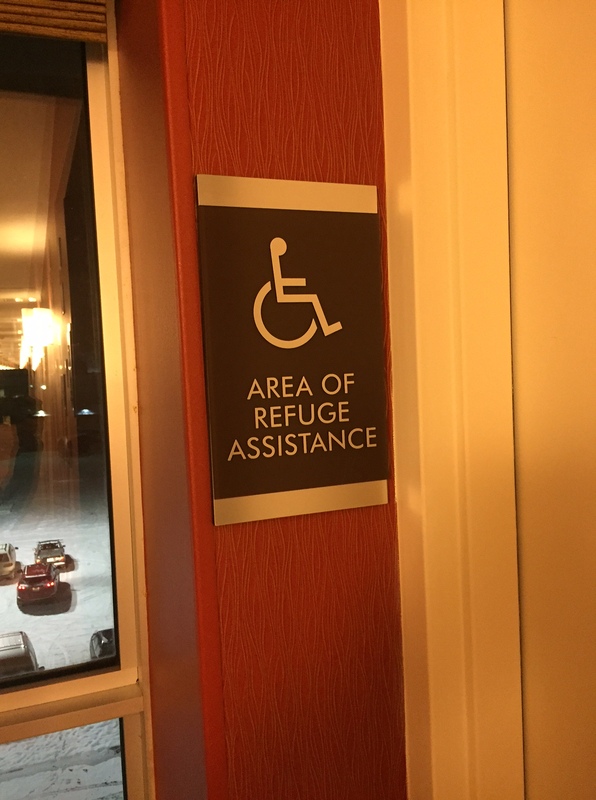 There was a fitness facility on the main floor of the hotel, which could be accessed by someone in a wheelchair. The hotel had a free breakfast every morning and free parking. 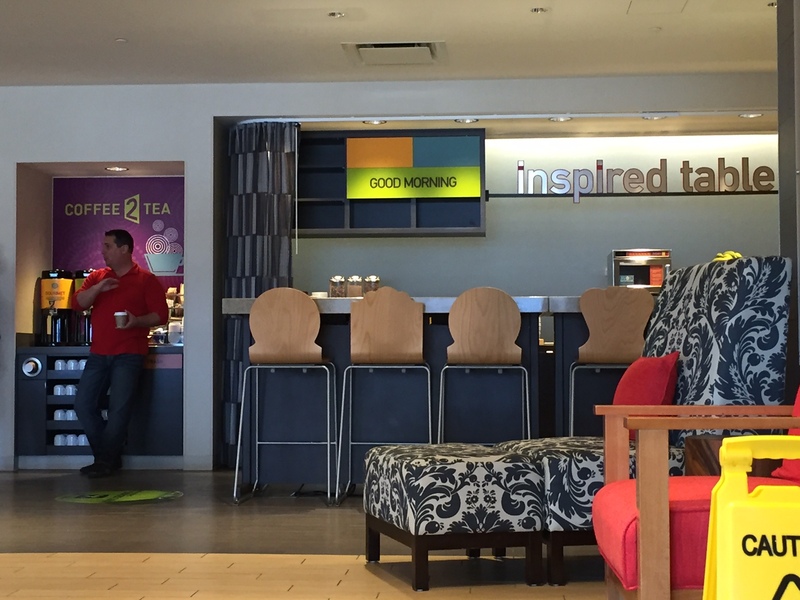 There was also a coffee and hot chocolate station beside the front desk that was stocked 24 hours a day. The staff here was pleasant and helpful. 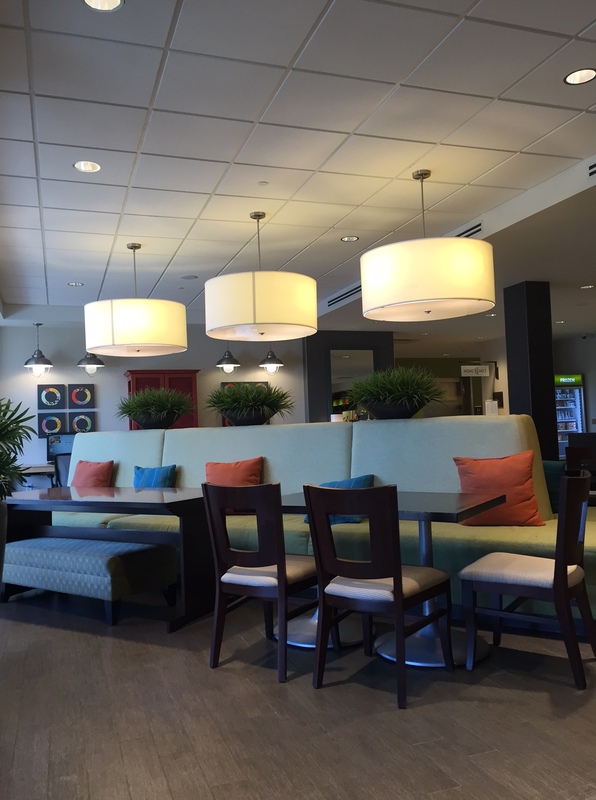 They were very nice upon check-in and the people helping during breakfast were very friendly. 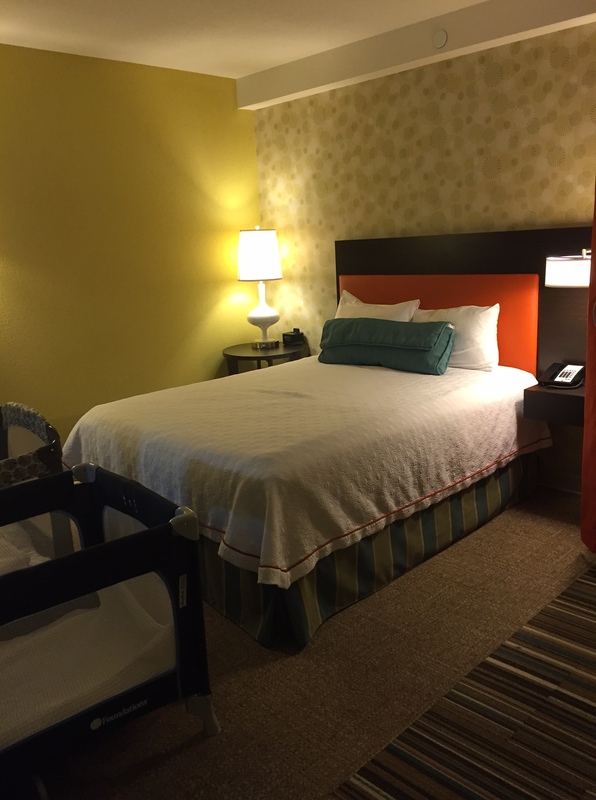 Upon check-in we were told that cleaning on the weekends was only done upon request. They kindly asked if we would like to have our room cleaned on the Saturday morning and we said yes. After we returned to our hotel room on Saturday night, it had not been cleaned, which was a minor inconvenience. The shampoo and body wash dispensers in the wheel-in shower are mounted on the wall. Unfortunately, they are mounted on the wall opposite the shower bench and no one sitting on the shower bench would be capable of reaching them. The breakfast, while okay, was nothing special. They had cereal, toast, waffle makers, milk and yogurt. They also had some cold hard-boiled eggs and some other egg products that could be microwaved. It wasn’t terrible for a free breakfast, but don’t expect a breakfast buffet. The pool area was quite nice with lots of chairs for sitting, a bathroom, showers and a nice, big pool. The unfortunate part was that there was no hot tub! I can never understand hotels that have pools but no hot tubs. On the plus side, the temperature wasn’t too bad and no one was ever in there! Both times that we went swimming, we had the entire pool to ourselves. 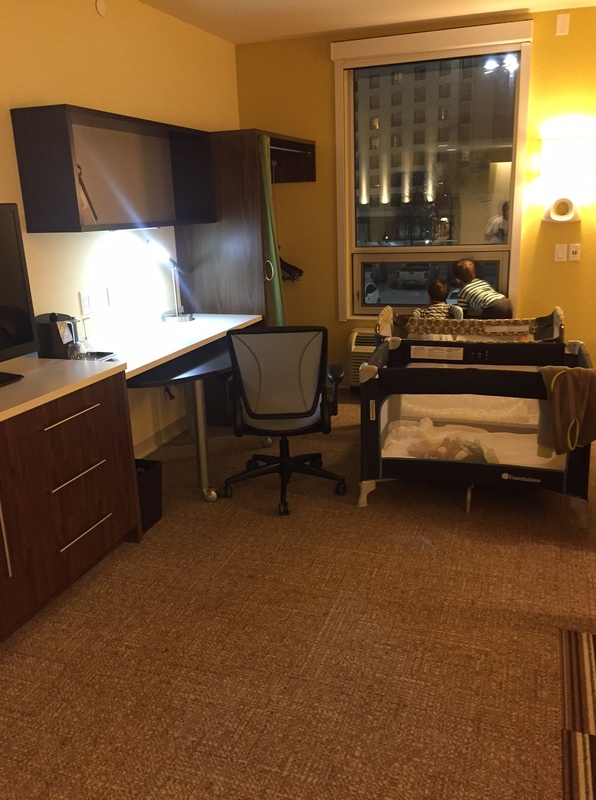 This was a clean, reasonably-priced option (about $130 a night) on the west side of Edmonton. 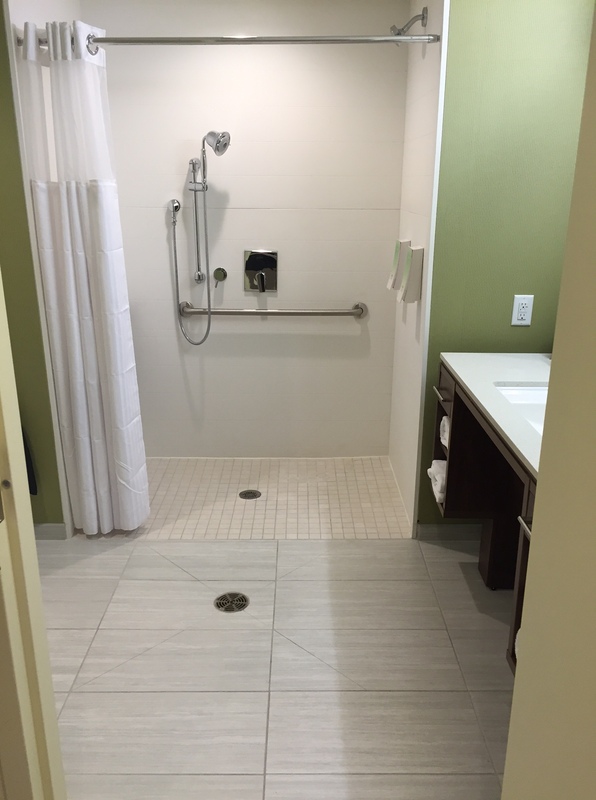 Given its affiliation with the Hilton brand, you can see that they have complied with the requirements of the ADA when designing the accessibility features of this hotel. 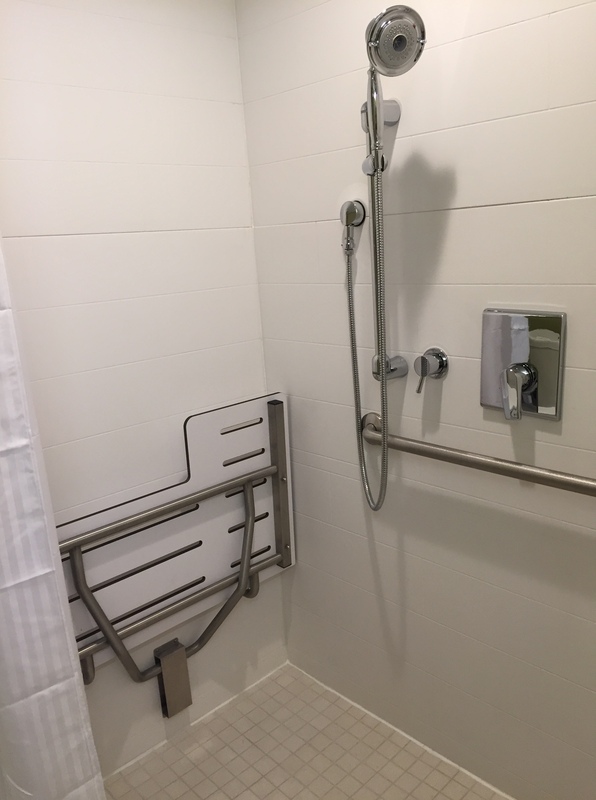 This entry was posted in Alberta, Canada, Edmonton, Uncategorized and tagged accessibility, accessible bathroom, accessible hotel, accessible hotel Edmonton, accessible pool, accessible shower, accessible toilet, built-in shower bench, Edmonton wheelchair accessible hotel, grab bars, handheld shower, Home2 Suites, kitchenette, pool lift, pull-out sofa, wheel-in shower, wheel-under sink, wheelchair, wheelchair accessible hotel by papawheelieblog. Bookmark the permalink. I really love reading your posts. They’re so informative. Thanks! I enjoy writing them! Love the post. Funny (not) that they could put the soap dispenser where a person couldn’t reach when sitting on the bench. Thanks! Yeah, it was strange. They seemed to think of every other detail, but that one was obviously overlooked. Love the posts. Funny (not) that they could put the soap dispensers where someone on the bench couldn’t reach.